Galaxy Note 9 vs OnePlus 6 vs iPhone X: Which Is The Best Pick? Samsung’s newly-launched Galaxy Note 9 is a beast of a smartphone, but it’s not the only beast in the town. Apple’s nearly a year old iPhone X is still outperforming almost every single Android device out there. And then there is OnePlus 6 that offers similar specs to the iPhone X and Galaxy Note 9 at almost half the price. So, which one of them should you buy? Here is the detailed Galaxy Note 9 vs OnePlus 6 vs iPhone X comparison to help you determine which could be a better pick for you. Both the iPhone X and OnePlus 6 have a display notch, though the cutout on OnePlus 6 is narrower than the device it copied from. The OnePlus 6 also has a slim bezel at the bottom, unlike iPhone X. The Galaxy Note 9 doesn’t have a notch. Samsung has kept slim bezels at the top and bottom of the screen. If you are not into the notch, the Note 9 may appeal to you. All three handsets have a glass back supported by a metal frame in the middle. You’ll not find a physical home button on any of them. The Note 9 and OnePlus 6 retain the 3.5mm headphone jack, which is missing on the iPhone X. On the back panel, the iPhone X and OnePlus 6 have vertically-aligned dual cameras while the Note 9’s dual camera setup is horizontally arranged. The OnePlus 6 and Galaxy Note 9 have a fingerprint sensor placed below the rear camera system. The iPhone X lacks the fingerprint scanner. Instead, it comes with an advanced 3D facial recognition system. The Galaxy Note 9 measures 161.9 x 76.4 x 8.8mm compared to the iPhone X’s 143.6 x 70.9 x 7.7mm and OnePlus 6’s 155.7 x 75.4 x 7.8mm. The Note 9 weighs 201g versus 177g for OnePlus 6 and 174g for the iPhone X. The OnePlus 6 has a gorgeous 6.28-inch Full HD+ Optic AMOLED display with 19:9 aspect ratio. Yes, it has a display notch, but the company allows users to hide it via Settings if they don’t like it. It has a resolution of 2280 x 1080 and a pixel density of 402ppi. The iPhone X gets a 5.8-inch OLED display with a 2,437 x 1,125 resolution and 458ppi pixel density. Thanks to its expertise in fine-tuning the color reproduction, Apple has ensured that the iPhone X display is pleasing to the eyes. But neither device can beat the Galaxy Note 9 when it comes to display because no company on the planet makes as good OLED panels as Samsung. Independent testing firm DisplayMate has found that Galaxy Note 9 has the world’s best smartphone display they have ever tested. It’s almost indistinguishable from perfect. The Note 9 sports a giant 6.4-inch Super AMOLED Infinity screen with QHD+ resolution of 2,960 x 1,440 pixels. It has a pixel density of 516ppi. As I said earlier, all three handsets are beasts in their own right. The iPhone X might be older than the other two, but its rivals haven’t been able to catch up yet. The iPhone X is powered by Apple’s custom A11 Bionic chipset. The Galaxy Note 9 and OnePlus 6 both run the same Snapdragon 845 SoC. The international variant of the Note 9 gets Exynos 9810 chip, though. The iPhone X has outperformed devices running Snapdragon 845 in numerous benchmark tests. On Geekbench, the iPhone X scored 10,357 points in multi-core tests compared to 9,088 points for OnePlus 6 and 8,976 points for the Note 9. In benchmark tests, the OnePlus 6 was running on 8GB RAM while the Note 9 was tested with the 6GB RAM model. Samsung has launched Galaxy Note 9 in two options. You can get the 6GB RAM variant that offers 128GB of internal storage. Or you can spend a little more for the 8GB RAM model that packs 512GB of storage. It also includes a microSD card slot that supports up to 512GB of external storage. With the Note 9, you’ll never run out of storage. The OnePlus 6 also comes in two versions: a 6GB RAM/64GB on-board storage, and an 8GB RAM/128GB internal storage. The storage options are sufficient for most people but if you are a power user, you might not be happy with just 128GB storage. On top of that, OnePlus 6 doesn’t support microSD card. Apple’s iPhone X packs only 3GB RAM, but don’t let the lower RAM fool you. Apple controls both the software and hardware of its devices, so it’s better able to optimize the software for maximum performance. That’s why it has outperformed every other device in benchmark tests. The iPhone X is available in 64GB and 256GB storage options. All three of them have dual cameras on the back. The OnePlus 6 features a 16-megapixel Sony IMX519 sensor and a secondary 20-megapixel Sony IMX376K lens on the back. Its rear camera supports slow-motion video recording up to 480fps at 720p, OIS, and dual-LED flash. On the front, it gets a 16MP Sony IMX371 sensor with Face Unlock and Portrait Mode. 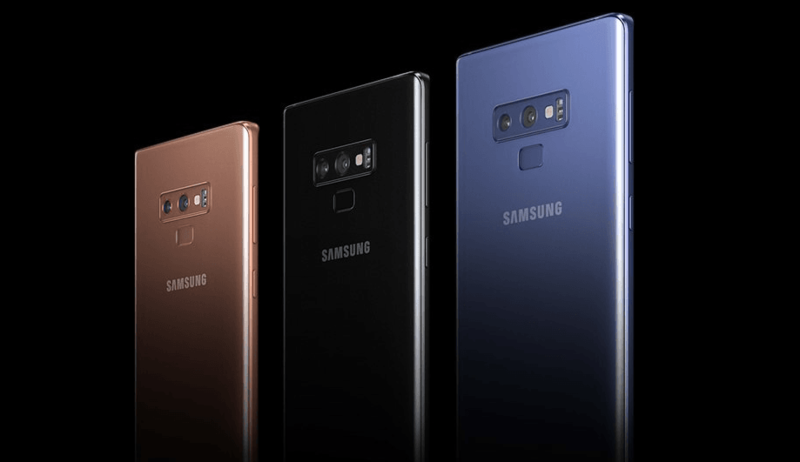 The Galaxy Note 9 packs a 12MP Super-Speed Dual Pixel wide-angle lens with variable apertures, and a 12MP telephoto lens with a fixed aperture of f/2.4. It supports up to 10x digital zoom and 2x optical zoom. The variable aperture technology allows the camera to switch between the two apertures automatically depending on the lighting conditions to take the best possible shot. It has an 8MP camera on the front. The Note 9 also gets a couple of AI features called Flaw Detection and Scene Optimizer. The Flaw Detection lets you know if there is something wrong with the picture you clicked. The Scene Optimizer analyzes the scene and the object and automatically changes the contrast, white balance, saturation, and brightness to take clear and crisp images. The iPhone X gets a 12-megapixel wide-angle lens and a 12MP telephoto lens on the back. It sports a 7MP camera on the front for selfies. The iPhone X includes a decent 2,716mAh battery, which easily lasts a full day of normal usage. It supports wireless charging and fast charging. OnePlus 6 comes with a 3,300mAh battery with Dash Charging support. It doesn’t offer wireless charging. I have had OnePlus 6 for a brief period, and I can tell you that its battery goes close to two days on a single charge. The Galaxy Note 9 packs a giant 4,000mAh battery with fast charging and wireless charging. Its battery hasn’t yet been tested in real life, but it should easily last a day of normal usage. The Galaxy Note 9 is aimed at power users. So, it gets an upgraded S Pen stylus with Bluetooth support. The new stylus can perform a variety of Bluetooth functions such as switching camera modes, advancing PowerPoint slides, controlling music playback, and more. The Note 9 also gets Samsung’s DeX experience that allows you to connect the device via an HDMI adapter to a monitor to enjoy a full-fledged desktop experience. The phablet itself will serve as the trackpad. The Note 9 runs Android 8.1 Oreo with Samsung Experience skin on top. It also offers iris and facial scanning, though they aren’t secure enough to authenticate financial transactions. The Note 9 also has an IP68 rating for water- and dust-resistant. It can remain submerged in up to five feet deep water for 30 minutes. OnePlus 6 merely offers splash resistance, which means it cannot survive being submerged in water. It also gets screen gestures and Face Unlock features. The OnePlus 6 runs Android Oreo with OxygenOS 5.1 skin on top. The iPhone X has an IP67 rating for water-resistance. It also includes a TrueDepth camera system that supports 3D facial recognition and augmented reality. This is one of the most important factors when buying a new smartphone. The iPhone X costs $999 for the base model with 64GB storage, and $1,149 for the 256GB model. The Galaxy Note 9 is not cheap either. Samsung has priced it at $999.99 for the 6GB/128GB model and $1,249.99 for the 8GB/512GB version. Not everyone can afford to spend so much money on a smartphone. The OnePlus 6 is pretty affordable, costing only about half as much as the other two. It sells at $529 for the base model with 6GB RAM and 64GB storage. The 8GB/128GB model is priced at $579 in the US. So, which phone should you buy? The iPhone X is a great phone, but it doesn’t make sense to spend a thousand dollars on it when the upcoming iPhone X Plus is just around the corner. If you are an iOS fan, wait for the iPhones coming out next month rather than purchasing the iPhone X. The OnePlus 6 and Galaxy Note 9 have similar specs. They both run the same processor, have large OLED displays, great cameras, and pack huge RAM. But the Note 9 costs twice as much as OnePlus 6. The value that OnePlus 6 offers for the price is unbeatable. If you are not a huge fan of S Pen or DeX, OnePlus 6 is a great buy.